“Education and Scientific Development in OIC Member Countries” gives an overall snapshot of the current situation of education in the OIC member countries through analyzing the major education indicators such as literacy rates, enrolment ratios, teacher-student ratio, and government expenditures on education. 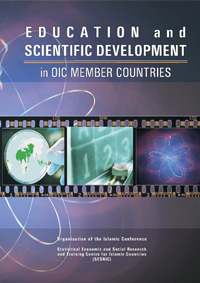 The report also highlights the state of scientific research and development in the OIC countries. In this context, the report presents an overview of the achievements made by the OIC member countries in the field of research and development (R&D) and science & technology (S&T). Some major related indicators are also analyzed. Such indicators are, mainly, human resources in R&D, expenditures on R&D, high-technology exports, and scientific publications.